Writer Jonathan Hickman (THE MANHATTAN PROJECTS, THE DYING AND THE DEAD) and artist Nick Dragotta (HOWTOONS) team up for a sweeping sci-fi western filled with world-building and an ensemble cast of characters in EAST OF WEST. The first fifteen issues of the New York Times bestselling and Eisner Award-nominated series will be collected into an oversized prestige hardcover. The First Year of The Apocalypse and will contain over 50 pages of bonus material, the full script for issue #1, and never-before-seen concept art. It will be in stores this July and is available to pre-order now. This is the world. It is not the one we wanted, but it is the one we deserved. In EAST OF WEST, the Four Horsemen of the Apocalypse roam the Earth, signaling the End Times for humanity, and our best hope for life lies in Death! 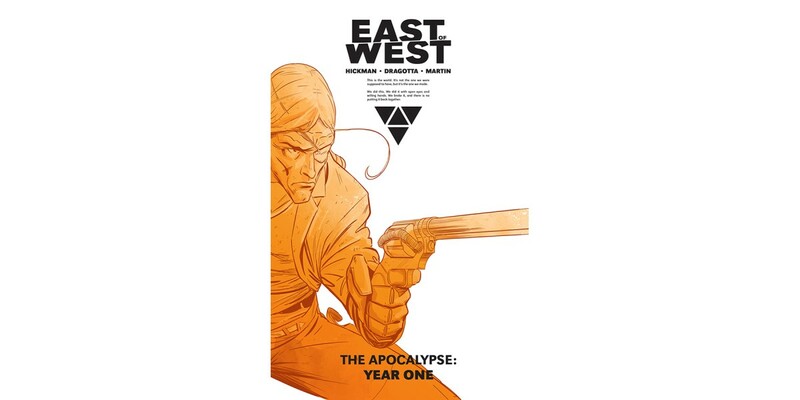 EAST OF WEST: THE APOCALYPSE, YEAR ONE (ISBN: 978-1-63215-430-9) hits comic book stores on July 8 and bookstores on July 21, and will be available for $49.99. It can be ordered by retailers from Diamond Book Distributors with Diamond Code MAY150491.